Contains 12 short films from award winning filmmaker RA Beattie compiled from the last 4 filming seasons. Scorpion Expedition - the Alaska - La Frontera Norte- Mongolia - The Arctic - Hawaii on the Fly & more. 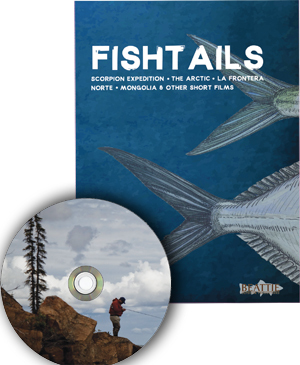 Many of these films debuted with the fly fishing film tour, but have not been released on DVD until now. Filmed on location in Alaska, Mexico, Mongolia, Hawaii, Northwest Territories (Canada), California Delta, and the Pacific Northwest. View the trailer on our website. Species include tarpon, bonefish, permit, trout, grayling, various salmon species, carp, pike, char, taxmen, and various bass species. Whether you're a saltwater or freshwater angler, this diverse collection will get you stoked to get out on the water, and just might inspire you to fish somewhere you've never gone. Bonus "Action Cut", a compilation of the best shots from 4 seasons on the water - cut to music. 120+ minutes.